You my friends asked for it, so here it is. Another great flavor to add to my collection of magic cake recipes. I’m still trying to decide which one is my favorite. Right now I think there is a tie between this lemon version and the chocolate version. I might choose this one because I really love lemon flavored cakes. Don’t get me wrong, I also love my chocolate, but there’s just something refreshing about this lemon magic cake. Maybe because it’s summer. I’m glad I tried this because this cake is very special, it’s so light and delicate, truly delicious and one of my favorite cakes of all time. Maybe not a cake in the traditional meaning of the word cake but truly a fabulous dessert. So many of you have written to me and asked how to make a lemon version that I just couldn’t resist. Many of you have also asked for different flavors as well, such as a coffee version or a peanut butter version. 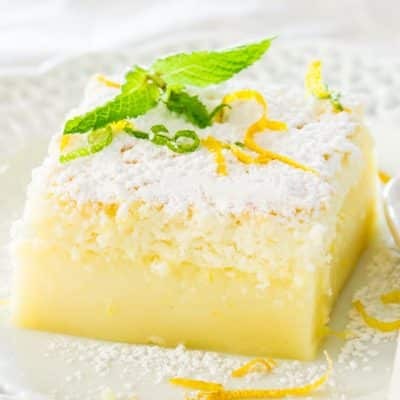 Maybe I’ll try those too sometime, but for now let’s enjoy this lemon magic cake. Every time I make this cake I try and think of all your questions. One common question is regarding the egg whites and how to fold them in. When you add the egg whites to the batter, don’t fold the egg whites in completely so that it’s a smooth batter. You need to leave those white bits in there. I just removed the whisk from the mixer and used that to fold in the egg whites for about 10 seconds. Also the baking time probably has a lot to do with how the layers turn out. I baked this lemon cake for exactly 70 minutes and as you can see after 70 minutes it’s still not totally golden brown on top, but I touched the top and it seemed firm enough. That’s how you know when it’s done. Make sure it’s firm to the touch, and not jiggly. If it’s jiggly it’s not cooked completely. Many of you have also asked regarding the baking time. Some people have said that after 40 or 45 minutes the cake is done, so I really believe that each oven is different. My oven is about 4 years old and it takes 70 minutes. I used to have an older oven and it still took 70 minutes, so I can’t really speak to the cake being done after 45 minutes. The important thing to remember is that the cake needs to be a bit golden on top and firm to the touch. Also I have made it once in a bigger pan other than the 8×8 inch square pan and it did not turn into 3 layers, so I believe that if the batter is not high enough there won’t be enough batter to turn into the 3 layers. So if you choose to make this in a 9×13 inch pan, I strongly suggest to double the ingredients. Another thing that I did different this time is instead of just spraying cooking spray or buttering the baking dish, I lined it with parchment paper, leaving extra on the sides so that it’s easy to just lift it up. This way there is no confusion as how to take the cake out. 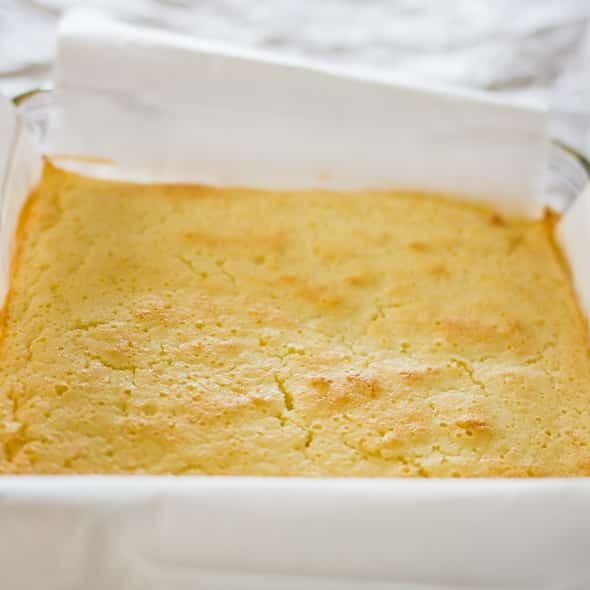 Lemon Magic Cake - one simple batter that turns into a 3 layer cake. Simply magical. The popular magic cake now in lemon flavor. Preheat oven to 325 F degrees. Grease a 8 inch x 8 inch baking dish or line it with parchment paper. Add lemon juice and lemon zest then slowly start adding the milk and beat until everything is well mixed together. Add the egg whites, a third at a time and gently fold them in using a spatula or a whisk, repeat until all egg whites are folded in, but there should still be white bits of egg whites floating in the batter. Pour batter into baking dish and bake for 40 to 70 minutes or until the top is lightly golden and the cake is firm to the touch. The baking time could vary greatly depending on the oven, so take a peek at around 40 minutes and see how it looks. I wanted to make a special lemon cake to go along with our Game of Thrones watch party and this one hit the spot! It is really interesting to have different textures in the same cake with only one batter. Along with the powdered sugar, I used whipped cream and a slice of candied lemon to decorate each piece. I think I would try using lemon extract instead of vanilla in the batter next time, to get even more lemon flavor. The more lemon the merrier! I would leave the vanilla in there along with the lemon extract. It’s hard to detect when you take a bite, but the vanilla really helps carry and bring out more of the lemon flavor. Enjoy! Thank you – I will try both vanilla and lemon extracts next time! My husband loves it.realy good. I made a double batch of this and cooked it in a 9×11 pan for 70 minutes. When I took it out of the oven it looks gorgeous and nicely browned and firm on top but the contents below are a bit “jiggly”. Is this normal? Yes, absolutely! One of the layers is custard. So, when it’s still hot out of the oven it will be a bit jiggly. We have now made them all. BUT I didn’t have lemons so I used limes and it was just like key lime pie. I always have to make 2 separate batches because by the time the 1st on cools it magically disappears 😁 With the lime one I also added a tad bit of green food color. I always have 3 layers so maybe she over baked them. Thanks for your Lemon Magic Cake recipe. 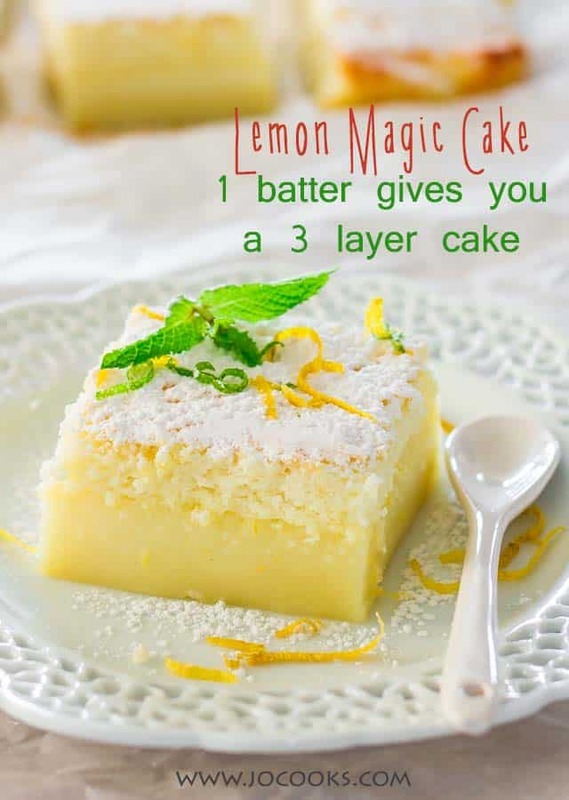 I was actually researching something totally different when I came across this recipe & video & I love lemon anything & the name “Magic Cake” totally intrigued me to make this. I studied the video & recipe for many days as I could not see “3 layers” unless you are included the powdered sugar topping as a layer. I could see the creamy base & cake topping (2 layers) but really didn’t see the 3rd. Anyway, thought I would make it to see for myself. It was easy to make except next time I would beat my egg white just before I need to add them to the main batter, as my beautiful fluffy whites had to be beaten up again as some liquidized in the bottom of the bowl…not a big deal they fluffed up again…I just would do right before needing them versus letting them sit for a bit. It also took 70 minutes to cook in my oven & I was wondering about how some others said 40-45 minutes. I had my baking rack in the middle of the oven…maybe those other people had their rack closer to the bottom as the heat was stronger & took less time to bake. I might try that next time to see. So all in all it turned out perfect & delicious, however I still could not see “3 layers” (unless you are counting the powdered sugar topping as a layer)…I got a beautiful smooth creamy base & a cake layer on top & then the powdered sugar layer…is that the 3 layers you are referring to? I would have liked it a little more lemony tasting so I might adjust that next time. I definitely will make this again & try some other flavours also. Hi Betty! The 3 layers are the cake layer on top, the custard layer in the middle and a fudgy layer on the bottom. The two bottom layers sometimes blend in together and may not be quite clear when you look at them. Check out the orginal magic cake recipe, where you can see the layers more clearly. Yummy is all I can say. I have made this twice, it tasted amazing but didn’t look like the photos on this sit, what am I doing wrong perhaps cooking it too long? Can you make this cake in individual custard cups. I also noticed no bain marie is required? Yes you can, you may need to adjust the cooking time. We’ve never used a water bath and have always had good results! You are free to use one if you want. Can you please explain to me: is the milk in the recipe is regular milk or special. Please be exact, so i can look for the right kind. It’s just regular milk, I usually use 2% milk. I always use powderd milk for my cooking and baking. I only drink almond milk so this is Handy for me to always have on hand. Can I use gluten free flour ?. We’ve never used gluten free flour in this recipe but I don’t think it would work out for this version. You’d need to find a gluten free version- I suspect you’ll need some xanthan gum. Can this cake be made ahead and frozen, or is it best to make right before serving? Do you serve it chilled? This is best served chilled because of the custard layer. If you make sure to freeze this nice and airtight to the cake layer doesn’t get soggy, you’ll be okay. At the bottom of the list of ingredients there’s an option to view the recipe in metric measurements. Can I use salted butter in your manic cake recipes? We’ve never used salted butter in these cakes before so I’m not 100% sure if it would affect the layers, but I don’t see why not. Since there’s 1/2 a cup of butter you may taste the salt a bit. 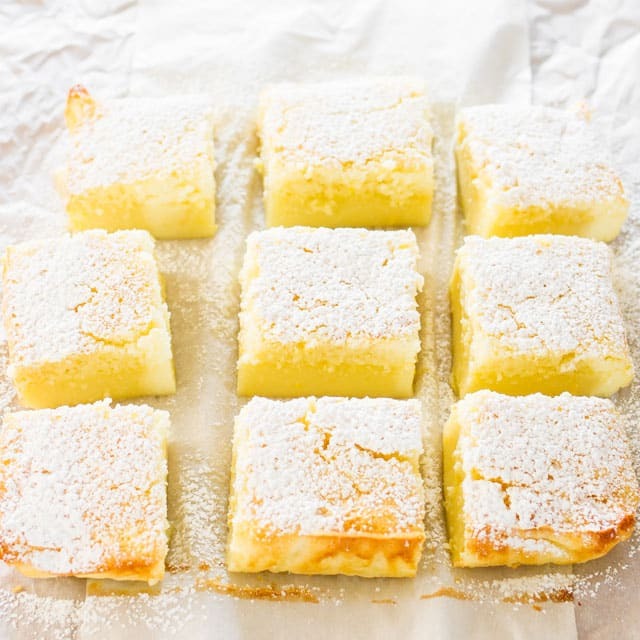 Can you freeze this lemon magic cake? For sure. This cake will last 4-6 months in the freezer. 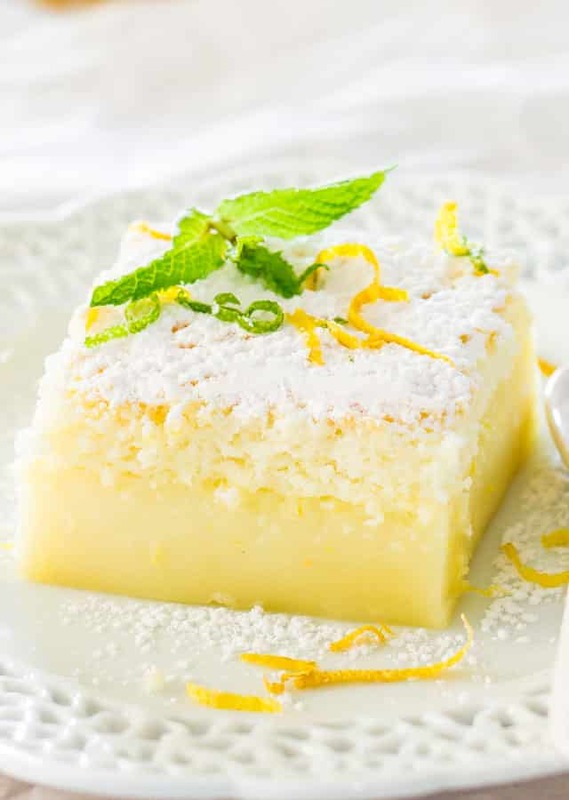 Can the Magic Lemon cake be made with coconut by adding a cup of sweetend coconut flakes? You can, you can try the recipe for Impossible coconut pie, which is similar in ingredients, but different method for making it.